Trump to the World: What are Human Rights Anyway? New Orleans One of the most poignant pictures I have ever seen in a newspaper was standing alone in The Wall Street Journal without an accompanying story. There were three fully armed US Border Patrol agents standing next to an opening in a piece of the existing wall between the United States and Mexico. The agents had their hands folded in front of them and were peering through their sunglasses at a small family of three, man, woman, and teenage daughter, in a group hug under the shadow of the wall. 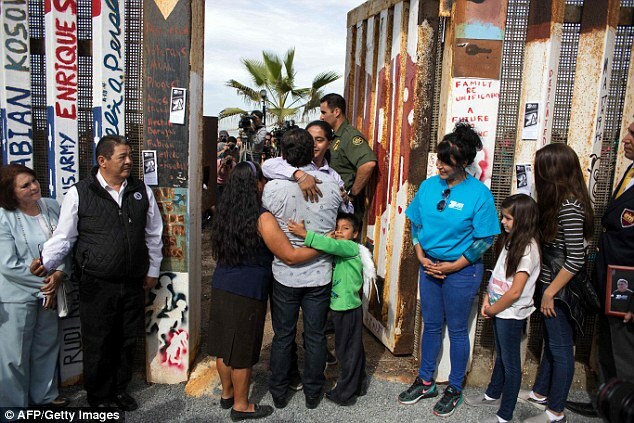 The caption of the picture was straightforward, needing no accompanying story, saying: REUNITED: Members of the Reyes family hugged Sunday at Border Field State Park in San Diego during a three-minute reunion as U.S. Border Patrol agents opened a gate to allow families to embrace along the Mexico border as part of Children’s Day in Mexico. The headline was equally powerful: On Children’s Day in Mexico, Love Knows No Border. Three-minutes, a short breath in a lifetime to bind families separated by a border and a wall. So, sad. The headlines elsewhere indicated that President Trump was having another all-about-me-day with a grievance and ego driven rally to celebrate his 100-days of whatever you want to call it. In a regular job we would call it a probation, but that doesn’t work, because he would have been fired for such a disastrous performance. This was in the wake of an earlier buddy-buddy phone call to Philippine President Duterte which ended in an invitation to him to visit the White House. Duterte has been on a vigilante tear in the Philippines supposedly directed at drug dealers and traffickers which has given license to police and others to kill thousands around the country without arrest or trial, evidence or questioning, in a campaign of terror against the poor, which has been a human rights horror of global proportions. Who is surprised? Trump, after being a fanboy to Russian strongman Putin during the entire election campaign, has also recently been solicitous of human rights disasters and dictators elsewhere. He has called the President of Turkey to congratulate him on his close and contested success in an election increasing his powers and essentially giving an American seal of approval on his purge of political opponents which has decimated the school, university, police, and public service of his country. He has also glowingly embraced President Sisi of Egypt who has also curtailed and jailed opponents large and small, eviscerated nonprofits, including those supported by the United States. So, clearly he is clueless about the human rights globally, but his continued drum beating about immigrants and building the wall, as the Journal picture illustrated so powerfully, is also a blindness to basic and fundamental human rights. This can’t be how we want our government to be seen either locally or internationally? Please enjoy Steve Earle Lookin For a Woman. Thanks to KABF. This entry was posted in immigration reform, International and tagged Love Knows No Border, mexico, On Children’s Day in Mexico, Trump Administration by Wade. Bookmark the permalink.